A resident of San Francisco, Staprans has called Northern California home for nearly his entire artistic career, more than sixty years. He describes his paintings as “purely Californian.” They each carry his signature palette of saturated blues, oranges, greens, and yellows. They are exercises in color, light, geometry, and perception. His depth of experience in the Golden State has resulted in work in sync with contemporaries in the San Francisco Bay Area such as Richard Diebenkorn, Gregory Kondos, and Wayne Thiebaud. The exhibition is accompanied by an extensive, full-color catalogue with essays by Paul J. Karlstrom, art historian and former West Coast regional director of the Smithsonian Archives of American Art; David Pagel, art critic for the Los Angeles Times and chair of the Art Department at Claremont Graduate University, California; Nancy Princenthal, writer and art critic; Ed Schad, associate curator at The Broad, Los Angeles; John Yau, art critic and poet; and Scott A. Shields, associate director and chief curator at the Crocker Art Museum, Sacramento, California. Full Spectrum: Paintings by Raimonds Staprans was organized by the Crocker Art Museum, Sacramento, California. SJMA's presentation is organized by Jessica Yee, curatorial associate. 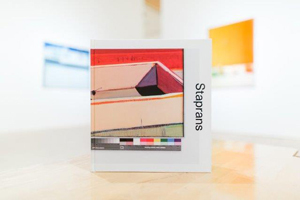 Raimonds Staprans shares a "daydream" about his approach to art. Raimonds Staprans’s still lifes of fruit, artist’s materials, and chairs are filled with rich color and light. Learn how to use bold colors and composition to great impact in this painting workshop. Workshop will be taught by local San José artist, Al Preciado.